The idea to build a V&A museum in Dundee was first raised over 10 years ago. Serious planning began in 2009, and construction began in 2014. It is now the pivotal project of Dundee’s 30 year plan to transform its waterfront. I lived in Dundee from 2010 until 2015. Every day I drove through the waterfront, watching it change bit by bit. The existing waterfront had been shaped in large part by the Tay Road Bridge. It was a vital 1960s transport link, but it brought some undesirable knock-on effects. These decisions were made at a time when riversides were less fashionable than they are today. The myopic plan effectively separated Dundee — and its people — from the river that made it successful in the first place. While I lived in Dundee, buildings now deemed flawed were unceremoniously demolished to make way for new plans. But in some cases, those new plans feel familiar. 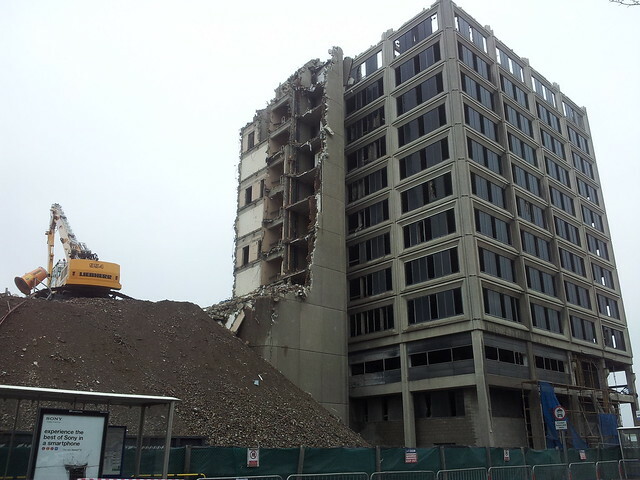 Tayside House was slowly chomped away. A suspiciously similar-looking office block is currently sprouting up in a similar location, to the disdain of many who point out that it blocks the view of the V&A from Slessor Gardens, the new green space behind the Caird Hall. The railway station was ripped down and replaced by a truly unsightly building that is a third too big to fit in with anything around it. To make matters worse, it is adorned with cheap-looking beige cladding and garish budget hotel branding. Over the way, a Hilton hotel was demolished, while a Malmaison took occupancy of the formerly derelict hotel across the road. The Olympia swimming pool, which sat on the current site of the V&A, moved to a new building a 5 minute walk away. The jury is out on whether many of these new ideas of the waterfront will stand the test of time. It is just as well, then, that the V&A provides Dundee waterfront with the proud centrepiece it needs. V&A Dundee is said to be Scotland’s first design museum. And it is the first V&A museum to be built outside London. I had read some fairly mixed reviews about V&A Dundee — both the building and the exhibitions. So I had prepared myself to keep my excitement in order. In the end, I was largely delighted by both the building and the exhibitions. When I heard that there were only two exhibition spaces, I feared that the museum would be disappointingly small. In fact, the spaces felt surprisingly large, even though they were rather overcrowded with eager visitors. The Ocean Liners exhibition is huge, and hugely enjoyable. Writing for the BBC, Will Gompertz says that it looks rather better in the Dundee building than it did in London. Meanwhile, the permanent Scottish design galleries are chock full of fascinating displays. For a Dundonian, it feels like a pimped-up version of the McManus Gallery’s Making of Modern Dundee gallery, except that it showcases all of Scotland. This gallery is all wrapped around the restoration of Charles Rennie Mackintosh’s oak room, on public display for the first time since 1970. The V&A point out that it’s appropriate that the new building has been designed by the Japanese architect Kengo Kuma, given that Mackintosh was heavily influenced by Japanese architecture. There are no complaints from me. My expectations for the building were exceeded. The exterior needs no introduction by now. Kengo Kuma says the design was inspired by Scotland’s cliffs. It’s a fabulous idea for a riverside museum, even if the grey concrete doesn’t provide much contrast to the silvery Tay. And its juxtaposition with the RRS Discovery is stunning. The building cleverly draws people in through a causeway that beautifully frames Fife, on the opposite side of the river. While the old waterfront shielded the river and turned people away, the V&A invites people through. Those people enjoyed milling around, admiring both the new building and the riverside view. I love the exterior of this building. There is a ‘B’ word I haven’t heard anyone describe it with, because it is as unfashionable now as riversides were in the 1960s. But I am going to use it. I think this is a stunning brutalist building. It’s brave for anyone to commit to putting this much concrete on a building these days. It is especially brave when it is to replace the sort of “concrete monstrosities” certain people so are disdainful of. But that is what brutalism is all about — bravery and honesty. I’m proud that Dundee committed to this level of bravery and honesty. The interior is delightful. Look up, and you are presented with a variety of materials interacting in surprising ways. Meanwhile, small windows cleverly frame fleeting snapshots of Fife and the river Tay. People were enjoying it — almost savouring it, in a way that you seldom see people enjoying a building. It is of slight concern that the terrace areas were closed “for maintenance” during my visit, just two weeks after opening. Hopefully just teething issues, and not something more fundamental. The building reminds me a lot of Harpa, the stunning arts venue in Reykjavik. It is a similar showpiece building that had a tricky birth fraught with funding problems. Harpa is also inspired by the nature of its nation, drawing people into the waterfront, and cleverly framing viewpoints from inside. Kengo Kuma wants V&A Dundee to be thought of as “a living room for the city”. There did seem to be lots of locals enjoying visiting the exhibitions. To put it bluntly, many of them seemed to be the sort of people you don’t often see in a museum. This is a great thing. Just now there is a novelty factor at play. We will only know if it’s truly worked when the same sorts of people are visiting the museum in 5, 10 and 20 years time. But it bodes well that the V&A Dundee is the pinnacle of a patient and determined grassroots effort at transforming perceptions of Dundee. Dundee certainly has a positive vibe around it right now. We wandered up to Reform Street, where the road had been given over to artists from the weekend. I put myself in the shoes of a tourist new to Dundee, seeing this fantastic museum, and witnessing happy, creative people making art on a road. I found this spirit incredibly impressive. It’s worth remembering that the original idea to put a V&A in Dundee came from a Dundonian, not the V&A. It’s the culmination of the city’s slowly gestating cultural renaissance, decades in the making. BBC News traced it back to the presence of Timex in the 1980s. Since then, Dundee has gone on a journey in industry, art and design to become world-class. The Dundee Rep Theatre, the computer games industry, and the Dundee Contemporary Arts centre are all significant milestones along the way. But they are almost footnotes in comparison to Dundee being awarded Unesco City of Design status, and the opening of its own V&A museum. If you had suggested this 40 years ago, it wouldn’t have been believed. These are cynical times, and it is unfashionable to be optimistic. When I read about events like World’s Fairs or the Festival of Britain, I wonder what happened that sort of spirit — of celebrating human achievement, building fantastic buildings and imagining better futures. V&A Dundee brings that spirit. It’s not always been easy, but it has built a fantastic building showcasing excellent designs, and it’s got us all thinking about the future of Dundee — a formerly self-effacing city, now determined to make itself good. Dundee has dared itself to dream. And even though I have made Edinburgh my home, this week I have been going to bed dreaming of Dundee.